The Tegra 4Bank produces as much light as a 1000W tungsten softlight using only one third the amount of power at 2.8A (120VAC) compared to a tungsten softlight at 8.3A (120VAC). 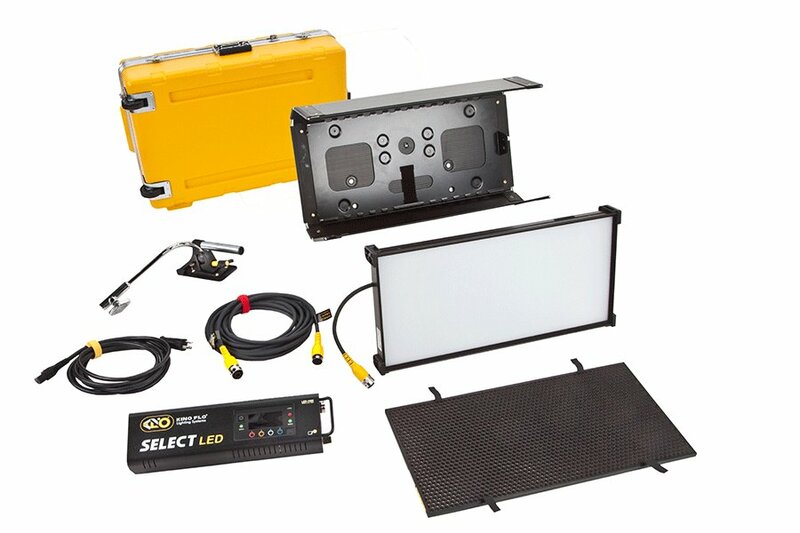 This is especially important when shooting on location and power availability is an issue. The low power draw is also an advantage when operating on battery inverter power sources. With its built-in ballast design, the Tegra 4Bank includes and manual dimming, and manual lamp switching with universal input voltage from 100VAC to 240VAC. The Tegra 4Bank also comes with a 15ft extension cable with an in-line power switch. If the fixture needs to be hung out of reach, a hand-held remote control dimmer (DIM-5), sold separately, may be used. The Tegra incorporates built-in barndoors with newly designed hinges. The all-in-one, lightweight Tegra makes it ideal for fast and easy set ups. For Kino Flo, heat management is a critical design element of fixture design. The physical heat of the lamp or buildup of heat within the fixture will directly influence the color temperature, lumen performance and lamp life. The lamps are properly spaced apart to maximize light output from the reflector and minimize heat buildup. The Center Mount is more flexible than a conventional yoke. A yoke limits orientation on two axes, tilt and pan. The ball center mount design enables the fixture to be oriented at any angle. An optional offset arm with baby receiver (MTP-B41F) may be used to center the weight of the fixture on a stand or can be under slung and used as an “up” light. With the push of reducing fossil fuel consumption, TV studios are looking at cooler, more efficient lighting systems to reduce costs and save energy. One of the most important values is Btu/kWh.